LAS VEGAS -- The Board of Governors will vote during their meeting Wednesday on recommendations from the League's general managers to change the overtime format to 3-on-3 for five minutes and to expand video replay to include a coach's challenge on goals scored off of potential offside or goalie-interference plays. If the recommendations are approved by the Board of Governors, they will go into effect for the start of the 2015-16 regular season. The general managers agreed to send the recommendations to the Board of Governors in their meeting Tuesday at Bellagio Hotel and Casino. The concept of 3-on-3 overtime is to create more space on the ice, which will allow for more goals to be scored and hopefully see more games end in overtime rather than the shootout, similar to the success that the American Hockey League experienced this past season. By adding a 3-on-3 element to its overtime format, the AHL had 75 percent of its games that went past regulation time decided in overtime this past season. The number was 35.3 percent in 2013-14, when they played under a strict 4-on-4 overtime format. The AHL's current overtime model extends overtime to seven minutes and starts with 4-on-4 before eventually going down to 3-on-3 if there were no goals scored through the first three minutes. The NHL had 44.4 percent of those games decided in overtime this season (136 of 306) in a 4-on-4 format. "I've always said that as exciting that the shootouts can be, I would prefer the games to get decided in the overtime and there's evidence that when you go from 4-on-4 to 3-on-3, it increases the likelihood of a goal in the overtime," Columbus Blue Jackets general manager Jarmo Kekalainen said. "We've seen that in the American League, we've seen that in the Swedish League. So I think there's a good chance the percentage of overtime goals will go up with this change and I think it's an improvement." However, the NHL Competition Committee, which met during the Stanley Cup Final, was torn between that format and a strict 3-on-3 format until consensus formed among the players that going directly to 3-on-3 would be preferable. 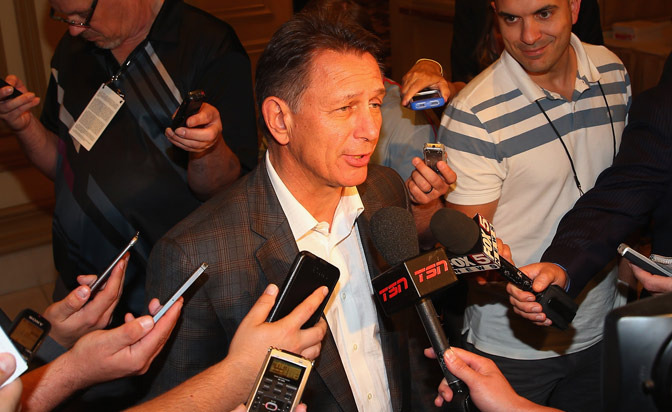 The GMs ultimately decided to go that route because getting to 3-on-3 was a part of any proposal. "We came out of the Competition Committee meeting with the Players' Association and we talked about both formats, and they went back to their representatives and players, and I think the consensus with them and back to us was 3-on-3 would be the right way to go," Nashville Predators general manager David Poile said. "I'm excited about it. We felt almost unanimous that we would like to have more games ended in overtime versus the shootout. We got our wish. We got 3-on-3. I don't know what the statistics are going to prove out, but I know there certainly will be less shootouts. This could be very exciting. It's another tweak to the game that could be very fan-friendly." The fan-friendly aspect will be a result of the excitement that the 3-on-3 overtime could create, according to Ron Hextall, the Philadelphia Flyers general manager. "There's obviously a lot of space and I think once there is one scoring chance at one end, typically if you don't score it goes back the other way," Hextall said. "It ends up being exciting, fast-paced and, obviously, the skill level of the players comes out. "It's just really risky hockey and it makes it very exciting. I saw some of it at the American League level and it's very exciting." The coach's challenge has been a topic discussed for several years. It is being limited to expanding video review to goals scored off plays that may potentially be offsides and plays involving potential goalie interference to ensure that more calls made on the ice are correct. "There's going to be judgmental decisions and calls made and we're never going to agree 100 percent on those, but it's going to give us a chance to get better calls and use the technology that's out there to help us," Kekalainen said. "So I think it's a big improvement as well." As part of the proposal, to use a coach's challenge, the challenging team must still have its timeout. "I think it's probably going to be a trial-and-error basis at the beginning since we've never had this type of rule before," New York Rangers coach Alain Vigneault said. "Probably take a little bit of getting used to for when the right time is, so there will be some strategy involved there for sure."